Exactly two months ago I underwent a minimally invasive laparascopic surgery, but let's face it, even minor surgery is still surgery. Thanks to Bar Method though, the 4-6 week recovery process was quicker and more painless than expected. You've probably heard me talk about Bar Method on the blog time and again, and if you haven't tried it yet (or you tried ages ago and haven't been back since) I have an amazing offer for you at the end of this post! The first couple of days were rough. My body was still shaking off the effects of general aesthesia. I had surgical tape over three small abdominal incisions and my belly button, along with strict instructions to leave it on for at least a week and keep the dressings dry. My stomach was so big and taut that you could've bounced a quarter off of it; I looked and felt like I was pregnant. It was during this time that I discovered the isometric exercises I'd been doing in Bar Method weren't just toning specific muscle groups so I'd look good in summer shorts and tank tops—they had also built up functional strength and resilience that made my recovery smoother. During those first few days my belly was so bloated I couldn't lie down comfortably or get up from too low of a seat, so I relied on my arms, shoulders, and triceps to lever myself up to standing—just like a reverse push-up. I had to squat and plié down to the ground because I couldn't bend over, but that was a cinch thanks to the strong quads and glutes I'd developed from thigh and seat work. The iota of independence I had thanks to the strength I gained from Bar (no need to ask Hubs to pull me off the couch or remove my shoes!) made me feel that much more confident. Even after the bloating subsided and the soreness set in, with meds it was never OTT, mind-blowing pain—more like the ab soreness I'd get the day after an obliques day. All the toning and strengthening I'd done in Bar probably helped reduce soreness, but mentally, there was also this mindset of "Oh, I've had pain like this before and it's bearable; this is just like the ache I get after doing too many curls." The speed of my recovery didn't just surprise me, it astonished my coworkers, friends, and husband. Within 2 days I could take 30-minute walks and was checking work emails from home. I was working from home within 5 days and back in the office exactly a week afterward, while the length of my walks had grown to 1-2 hours. I was still more tired than usual and working fewer hours, but overall I felt pretty good—having basal strength and fitness definitely helped. One of my coworkers who had a similar surgery did not have as smooth a recovery process, and when we compared notes, one of the few significant differences we noted was that I'd been doing Bar regularly pre-surgery. Toward the end of the 6 weeks I was literally counting down the days until I could get back in the studio. It's been 4 classes post-surgery so far. Health-wise, I'm fully recovered from the surgery, but the procedure confirmed that I have stage 4 endometriosis, which wasn't exactly the news I wanted to hear. Exercise is supposed to have all sorts of anti-inflammatory and pain management benefits for endo though, so if anything I have more of an incentive to get my shake on! And now, that amazing offer I was talking about! 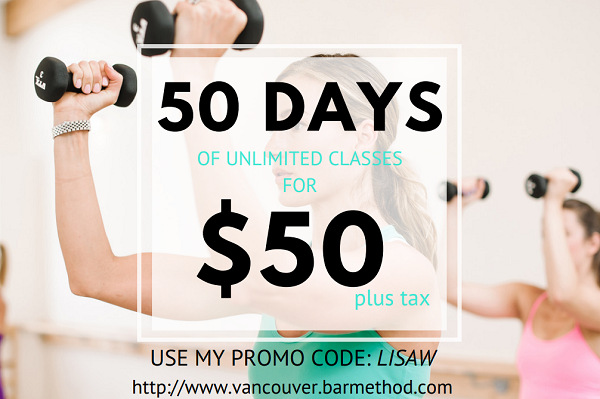 I'm so pleased to be partnering up with Bar Method Vancouver to offer 50 days of classes for $50 (normally a $250 value) to Solo Lisa readers! Just to give you an idea of how good of a deal this is, a single drop-in class is $28, and the next comparable offer is the New Client Special which is 30 days for $80. Even if you only go twice within those 50 days, the offer will have paid for itself. The offer is good for new clients and clients who haven't bought a Bar Method package in a year or more. The 50 days starts from whenever you activate the package by booking your first class. This means it's totally fine if you buy now and don't start until your busy fall is done, you're waiting for outdoor workout season to be over before you start indoor workouts again, you won't start until New Year's fitness resolutions roll around, etc. After your 50-day package expires, you are still eligible for the New Client Special (30 days for $80)! That's 80 days or almost 3 months for $130, which is just ridiculous. Packages expire within one year of purchase. To purchase the offer, use this link and enter the special promo code lisaw. Click the Schedule tab, which will open the mindbodyonline store in a new browser tab. Click the Online Store tab. Select Classes - TBM Classic from the dropdown menu. Select 50 Day Introductory Special. 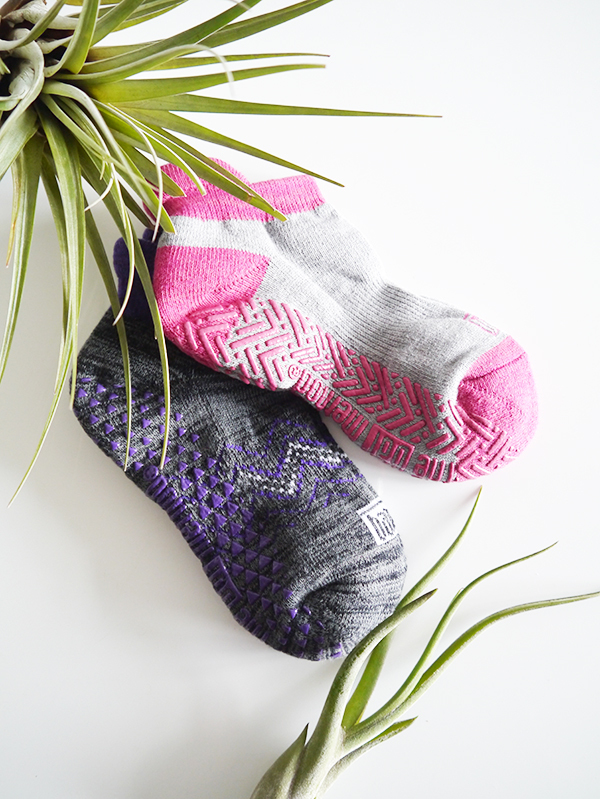 Enter the promo code lisaw when prompted to get the deal. The code is good between today and September 15, 2017, 11:59 PST.